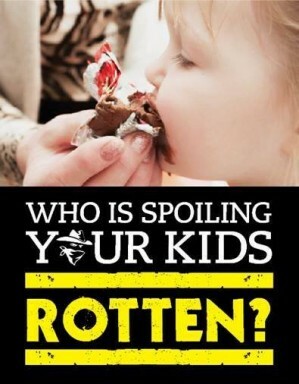 Who is spoiling your kid rotten? The sugar bandit! This is the “catch cry” for the Dental Health Week 2014. Hopefully it’s not the child’s parents who have learnt not to put sugar drinks in a baby’s bottle, or allow soft drink and sweets be a regular part of their child’s diet. The sugar bandit is often grandparents, aunts and uncles, cousins and other family friends. PLEASE DO NOT FEED CHILDREN SWEETS! Do they have to be rewarded for just visiting you? The child now develops a taste for sugar which can drive their parents crazy! Not to mention potential life problems with their diets that could lead to diabetes, heart problems and so on. Baby teeth are important for maintaining the bite till the new teeth are through. If baby teeth are lost too early it could alter the bite and sometimes facial appearances if the jaws do not line up properly. Besides, who wants children to suffer toothache and swelling! This is also on the rise. Sealing very deep grooves in baby and permanent teeth is an effective way of reducing decay. This is achieved by adding material to the grooves to make the tooth surface self-cleaning. Let’s make life easy for the child (and the future adult). It’s important to watch children’s diets. Clean and maintain the mouth, teeth, gums, and general health properly. Please, see the dentist regularly from 12 months old. These early visits are for the parents as much as for the child. We all want as best as possible start to life, and to get into habits that will have a lasting benefit for life. If the child is eligible, use the child dental scheme, to prevent problems and gain valuable advice. Lastly, train your relatives, friends, baby sitters not to be Sugar Bandits! Next week: To HELL and BACK!